At Always Belle Photography we are so excited to introduce PayRIght! 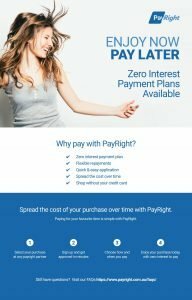 PayRight is an Australian owned & operated Buy Now, Pay Later provider offering point-of-sale credit and payment plans with zero interest. At Always Belle Photography, any products or collections over $1500 can now be purchased on a 3 or 6 month payment plan with fortnightly or monthly repayments and you get your products immediately! This can be arranged at your ordering and reveal session with a minimum 20% deposit on purchases.